A Scottish genre and landscape painter, Geddes started as a house painter earning two shillings a week. He married in Edinburgh and then returned to Blairgowrie, becoming indelibly associated with the town. His early reputation was largely due to his meticulous studies of fish, Perth Art Gallery holds one such example entitled Two Fish. He exhibited at the Royal Scottish Academy between 1865 and 1884 and at the Royal Glasgow Institute between 1861 and 1884.In 1871, and again in 1875, he visited Paris, studying for two months in the Louvre, during the latter trip he was arrested as a spy. In 1882, he won a Gold Medal and £50 for the best genre painting in the RSA. 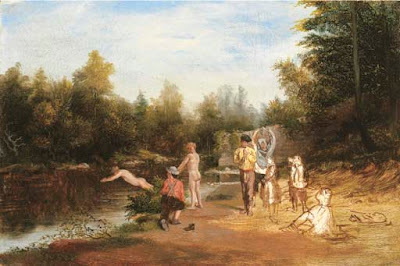 As can be surmised by the composition of this painting, 'Dookin' is a colloquial term for bathing or swimming. The location of the finished version of this study is currently unknown. The River Ericht runs between Loch Ericht and Loch Rannoch, north-west of Blairgowrie, Scotland. Thanks for doing a nice write-up of William Geddes. He was my Great Great Great Grandfather. We have two of his paintings at our home in the Pacific-Northwest of the United States. We have visited Blairgowrie a number of times and saw the wonderful exhibit in Perth. William's son, Ewan, was also an accomplished painter. That's really interesting - many thanks. Charles G Hards - Do You Like Butter? John Morgan - Which Hand Has It?